This entry was posted in Aged care and tagged Aged care by Bernie McCarthy. Bookmark the permalink. Hi I have an 87 year old mum she leaves in Ba with the family friend she is mobile at her own pace . She has no interaction, verbally abused ,has problems with her meals and gets very anxious & no one to share with. She has hearing impairments I am her daughter I live in Australia with my family & I visit her once a year due to my husband’s health condition.. I really appreciate if you can please help my mum in this situation.. Looking forward to hear from you soon. Thank you. Desperately looking for a Rest Home or Nursing home for my sister in law in either Nadi or Suva. She has early onset of Dementia/Alzhiemers. Can any one help with recommendations. We have family there that could research for us. Sorry Donna. I can’t help as I do not have any contact with Fiji. The lady who wrote this blog is no longer living there. Apologies. Sorry I have no contacts in Fiji anymore. I need a aged care facility for my aged mother in Fiji.could you make some suggestions as to who I could contact.we will pay for her care. I got my parents living in Rakaraki. They need support ie a livein housemate plus who can look after our farm as well. Have you got someone reliable then please let me know. Thanks. I am looking for a carer/ agency for a client coming to Nadi Fiji on holiday. Any assistance of where to contact would be most appreciated. My apologies Danielle. My contacts in Fiji have left there some time ago and I am not familiar with Fijian services. Best to go through government services perhaps as a starting point but you have probably tried that already. Dayawanti’s email is dayawanti@spectrumart.com.au .Please forward any information about a carer for my mum living in Suva, Fiji. Sorry for not providing my email with the first reply. Iam looking for a carer in Suva, Fiji,for my mum in Suva. Please contact me on my email or my phone number 07 55 446859 regarding any information. My Aunty was Father Hew Law’s housekeeper for 40years, she is 89 this year and misses her dear friend very much, as do we all. I was honoured to live in the Presbytery along with my cousin for sometime before going to boarding school. Father Law was a hard working, beautiful, amazing gentleman and very much loved by the whole of my huge family along with his parishioners. I would dearly love to view what he has done in Navua Fiji first hand and then help in some small way to continue what he has done in appreciation in his name, kind regards Rosemary. I was wondering if you could assist me in any way possible. I am a Registered Nurse currently living in New Zealand.I have had 5 years experience in aged care and dementia and would love the opportunity to work and live in fiji. How do i go about applying for such work in your country.? My passion is with the elderly although i am open and always willing to learn new skills in order tyo enhance my learning abilities, knowledge and nursing skills. I look forward to hearing from you soon.You may email me at the above address.Thanking you. 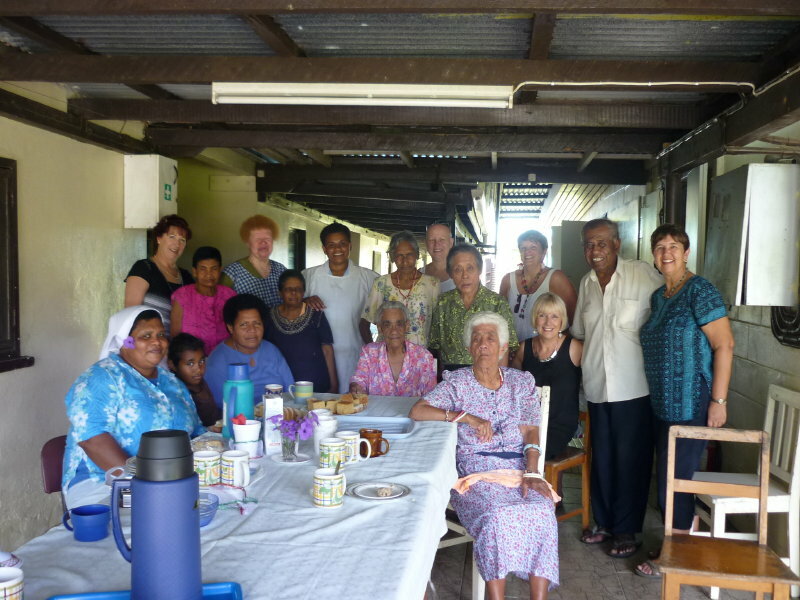 Our Fiji Catholic group in Brisbane donated 13 hospital Beds and other Cleaning equipments (a 20ft container full of stuffs) to the home last November 2011. We have not heard anything from the home still. Can you please send us photos of the beds so we know that it is being put to good use. Can we also get a thank you letter which I will pass to the St Andrews hospital and also to motivate our members and maybe…maybe can assist the home again in not to distance future. Thanks for your comment. We are not directly connected to Father Law Home but I have the email address of the person in charge who you could talk to. I imagine you must already have some communication with them to have sent a container to them so a direct contact would be best. Thanks for the reply. Our contact at Father Law home that we spoke to about the beds was Sisiter Veronica, but she is no longer there. Can you send me the email address of the person in charge. At least some photos and thank you letter is all we ask for. Hello To whome this may concern. I am inquering some information regarding old age care. I would like to know where is these fathers home located in Fiji. I my self is from fiji my aged parents still live there. I am in desparaite needs for my father. I live in Canada presently and would like some information.My father is 70+ yrs old and my mum is just as old and is not capable of looking after him anymore. My both parents live in Lautoka Fiji and i woild really appreciate if you can help. I can put you in touch with Yvonne who originally wrote the piece on Fiji aged care. Send me an email to bernie@mccarthypsychology.com.au and I will give you Yvonne’s email. Hello Bernie,am following to email from March which you reaplayed to me. So i would like to get in touch with Yvonne who wrote the piece on fiji aged care. I am looking forword to hear from her. Hello Bernie, i am contacting you in regards of my inqueres how ever i would like you to get me in touch with Yvonne email or possibly phone number. Please reaply soon.Thank you. Hello Bernie, i am following your email from march 28. Yes put me in touch with Yvonne’s email or possibly phone number. I would appreciate your reaple. Or if you can help with addmition for age care for my father. Could you please direct me in right direction for a full time stay care for my mother who is 80+ years old. A great article on aged care in Fiji. I see that things have not changed that much since my days of working in the sixties in Fiji. I still have many contacts and am following up on some points raised in Yvonne’s article. As an aged care consultant and former CEO and having knowledge of the many challenges in Fiji I will be raising some matters with people who have contact and knowledge at a very high level of aged and community care matters. LIndsay. That’s very thoughtful Marg. I will pass this on to Yvonne. However, it may also be effective to email the nursing home directly and establish communication with them before you leave. The email address is at the bottom of the blog post. I am a nurse in an Aged Care facility in Australia. I have family living in RakiRaki and will be visiting them in April. I would feel very privileged if i were able to come and visit the residents at Father Law Home if that was considered appropriate and if they gave permission.I start my leave this Friday 8th April and will be in Fiji from the 12th for 4 weeks.A contact number for me would be the RakiRaki Hotel where the manager is a relative.Look forward to hearing from you. I hope this helps with your difficult situation. Could you please direct me in right direction for a full time stay care for my father who is 70+ years old and is completely blind from diabetes and losing his mind, and my mum is just as old and she is not capable of looking after my father anymore.